Last Saturday, I introduced you to Bumbershoot Designs and Supplies, a good source of all types of vintage beads. Well, today I want to show you what I made using a few of their wonderful glass pearls and leaves, and crystals. 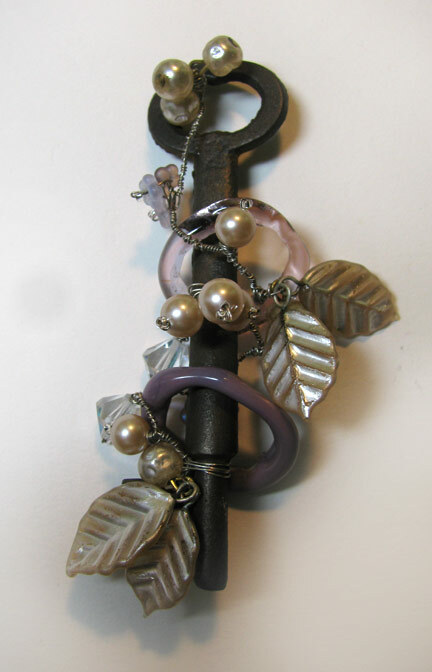 Using an antique skeleton key around which I had previously formed lampwork rings, I wired the pearl and crystal elements together with a few supplemental glass vintage glass flowers that were in my stash hoard. All it needs to finish it off is a chain! I'll be posting a tutorial in the future, but in the meantime, I'm going to let you all have a crack at winning the remainder of the beads that I didn't use in this project. See that picture at the top of the post. Well, minus the wired pearls, the pearl-colored leaves, the little baggie of clear crystals, and a few glass pearls from the strand, all the rest are up for grabs. Just leave me a comment below telling me how crazy you are about vintage beads and you'll automatically be entered to win. If you tweet or post on Facebook or other social spots about the contest, you can leave a second comment and be entered twice! Please make sure that your link will lead me to an email address, or else I won't be able to contact you. No contact, no win, and I simply have to go on to the next person. Deadline: October 19, 2011. I'm loving the vintage beads you have shown, thanks so much for a chance to win! I like what you did with the key - very nice! I am MAD for vintage beads and jewelry!! I go to estate auctions and try to buy the broken necklaces & bead strands for cheap. (the ones that are not broken are expensive). Would love to win this loot!! Thanks for the opportunity. I 'LOVE' vintage beads. I used some of my granmother's and mother's old necklaces to make some cute bookmarks to give away on a trip a year or so ago. They just make everything feel special. I'd love to win the rest of those vintage beads. Just tweeted about your great design and giveaway. Just posted on my facebook page. Oooooh, i HEART vintage anything! i am brand new to the fascinating world of beading! I would LOVE to win these! Thanks for the opportunity. I love vintage beads. I've found some really gorgeous things in old jewelry. I love anything vintage! I make jewelry from vintage components and specifically love the 1920s! Vintage beads are the best- you know that they are not going to be duplicated by everyone else who shops at Michael's. I would love to win some of these lovely treasures and I love what you made with them. Very cool! I'm really starting to love vintage beads. I was given a box of jewelry from my friends grandmother and it was stuff from the 50's & 50's. I reworked some pieces and I get so many compliments. I guess some things just never go out of style. So I would LOVE to do something cool with these. Thanks for offering them. I love all things Vintage:) I am just itching to get at those gorgeous beads! Another fabulous giveaway! 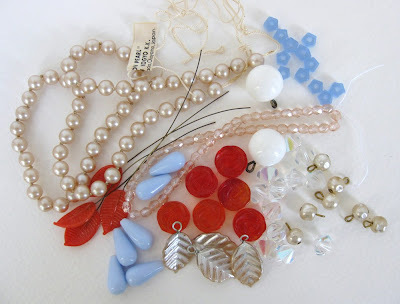 I would love to try my hand on these vintage beads --- I love working with anything vintage. Your key turned out beautiful. I've been looking for some great vintage pieces for a wedding piece. These would be great! I would love a chance to win them. well of course I love your keys, & I went , drooled over the site AND bookmarked it as a supply source,why wouldn't I want these goodies?! I am crazy about vintage beads. I would love to win. I just blog about the contest~! The key is really great. I'd love to win the vintage beads. Great giveaway. Thanks. I love vintage beads so much more since they are of better quality and styles that you can't find any were else. When I find vintage pieces and parts of jewelry I just buy them. I never know when and what will work out perfect in a jewelry project I am working on. I love, love,love vintage beads.I'm always on the lookout at garage/yard/estate sales. Just tweeted about your giveaway again. I love vintage beads. I love these beads! My favorites are the red leaves on the wires. Thanks for the giveaway! i love vintage beads, especially vintage glass pearls n rhinestones! Love the blue beads - they'd make some snazzy earrings. I'm hot hot hot for vintage beads, always have been, even as a 5 year old girl I knew that old was IN, you know what I mean? LOVE IT! Sending out lots of love for Bumbershoot and the vintage beads you got from them. I have purchaased several things from them and it is always A+ top quality. I would love to have these beads!!!! Whats not to love about vintage beads? They are yummy. Lovely beads, love to win, thanks. Vintage beads make me feel all warm and fuzzy inside. I know everyone here feels the same.....thanks for the chance to win! I love what you did with the key and can't believe you're willing to part with all of that cool vintage stuff. Very fun. I will visit your blog again. Beautiful work with the vintage key. I love it. I love vintage beads. They have a look that is different from anything out today. Not onky do I like vintage beads a lot, I find Bumpershoot's products to be very unique unique. I am a vintage bead junkie! Thanks for having the giveaway. I love beads! and these vintage beads you have here are so gorgeous! I love these vintage beads. Especially the pearls. I like to incorporate them into new pieces with freshwater pearls and silver or copper findings. Thanks for the chance to win! cool give away! I love vingage beads!thanks for the chance to win some!